Today we’ll review a couple of cases from the popular brand of Urban Armor Gear. The first case is from the Plyo Series. We were sent one for the Galaxy Note 8, but this series is also available for iPhone X, 8, 7, and 6s Plus. The case looks a lot simpler than most UAG cases we’ve reviewed. They are translucent, and come in Crimson(red), Ice(clear) and Ash(grey) colors for the Samsung Note 8, and an added Glacier(blue) for iPhones. 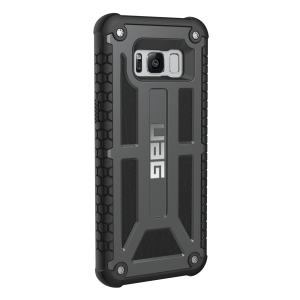 The cases are sturdy like other UAG cases and meet military drop-test standards like others. They also have soft, cushion anti-shock corners to help protect from phone drops. And good news for those who use Apple Pay and wireless charging- the cases are compatible for these activities. These cases retail for $39.95 and come with a one year warranty. Now, on to the Monarch series. These cases give me the UAG design vibe. The classic armor frame with the UAG name on the back, and the alloy metal screws holding things together in the four corners. It’s very rugged looking- reminds me of a truck tire. Notable about the Monarch is the five layer protection, and that it has been drop tested to 2 times military standards- which is saying a lot. 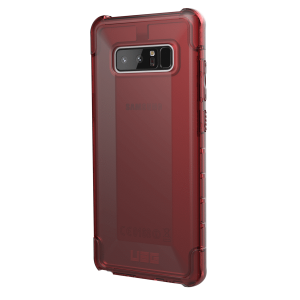 These cases are available in just the black case for Samsung Galaxy S8 and S8+, but adds a red color for the Galaxy Note 8, and even more colors for iPhone- the most colors for iPhone X. You can get a better idea of all the colors on their website here. All this protection will run you higher in cost than most cases at $59.95 USD, but there is a 10 year warranty, which is a good long time to protect your phone.